A Legacy of Passion: Segal Ranch is a third-generation, family hop farm widely known among craft brewers for estate-quality hops and a commitment to innovation in hop growing. 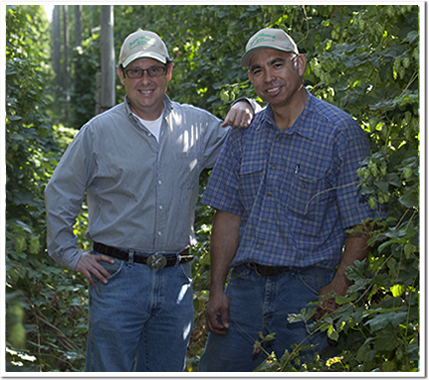 We are located in the Yakima Valley in Washington State, a legendary terroir for hop cultivation. John was a hop geek at birth. Proof? He brought a block of hops to show-and-tell in first grade. He received his brewing legs at Anchor Brewing Company in San Francisco, fresh out of college. After his stint at Anchor, John joined the family hop business. Five years later he parted company with his father to work in the media industry. When his father passed away, John stepped back into the business. An alarming landscape in the hop industry awaited him. Craft brewers were paying exorbitant prices for their hops from intermediaries. Worse, to get hops, craft brewers had to sign five-year contracts. At that time, Segal Ranch had been an Anheuser-Busch grower for over 25 years and Anchor Brewing Company was our only craft brewing partner. The direct relationship between our ranch and these brewers created opportunities for collaboration, experimentation and innovation. John envisioned broadening the range of craft brewers that Segal Ranch served and replicating this productive grower-to-brewer model. Today, Segal Ranch has wonderful direct relationships with some of the top craft breweries in the world. And John is having a blast doing it. Martin Ramos is the manager at Segal Ranch. He was nicknamed the "hop whisperer" by Vinnie Cilurzo, impressed with his magical hop-growing prowess. Martin had the good fortune to learn how to cultivate and breed hops, literally from the ground up, from the late Chuck Zimmermann, a former USDA hop research scientist and renowned innovator in creating new hop varieties. For over a decade, Martin honed his knowledge and skills working in hop research and development at Hopunion. Martin joined the Segal Ranch in 1997. As he puts it, "I learned about how much pride and passion (the late) John Segal had for his ranch, the way it operated and what it produced, and it's infectious. I'm very excited to know that still continues on with this family."